When you think of living in Rochester, Minnesota, one thing is sure to come to mind immediately: the Mayo Clinic. There’s much more to Rochester than this renowned medical facility, although the city’s claim to fame is another great reason to call the area home. Just a short drive from the Twin Cities, Rochester has its own unique character and Minnesota charm. 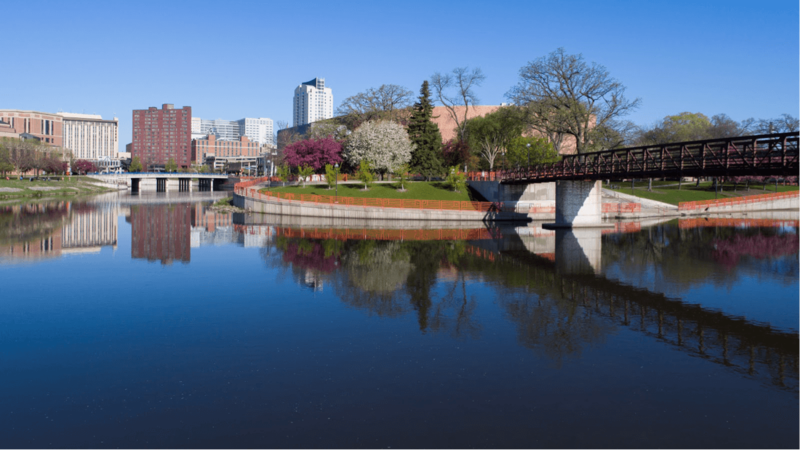 See what makes this city special with our moving guide full of things to do in Rochester, Minnesota. Visit the Rochester Civic Theater for theatrical performances that rival big-city offerings. Throughout the year, this facility hosts numerous plays and musicals that garner rave reviews. Immediately south of the theatre, you will find the Rochester Art Center, which is home to a wide variety of contemporary art in a modern facility. For live music performances, check out the Jive Mill. This venue attracts talent from local bands and across the state. When the weather is nice, visit the Riverside Concerts venue for an outdoor show with neighbors from around town. It’s a great way to get to know people in the area and have a blast listening to a great performance. One of the most common reasons for anyone to move to Rochester is a change in employment. The city boasts a thriving local economy that’s boosted by a few major industries. Of course, the medical field is huge in Rochester with the presence of the Mayo Clinic. The hospital has been on Fortune magazine’s “Best 100 Companies to Work For” list for the last 14 years straight. In addition to Mayo, one of IBM’s largest facilities is located in the city. Thousands of employees work in this building, nicknamed “The Big Blue Zoo,” which has steadily expanded over the decades. In addition to these large centers of employment, Rochester supports a thriving agricultural industry, with many farms surrounding the city. Rochester is home to over five square miles of park land spread across 100 separate locations. One of the most popular park areas is the Quarry Hill Nature Center located on the eastern side of town. It’s the ideal place to break out the cross-country skis, bird watching binoculars or hiking shoes for outdoor activities year round. The nature reserve also serves an educational purpose with indoor areas dedicated to teaching children about local wildlife. In addition to great parks, Rochester boasts 85 miles of paved trails. Running, walking, biking or jogging these trails is a great way to get to know the city. One terminus of the Douglas State Trail is located in the city, which is built along an abandoned railway, providing a glimpse into history along its course. The Rochester Public Schools District serves the area and is well regarded for its quality of education. Whether you have young children or teenagers, Rochester has 23 public schools that integrate technology into the curriculum and challenge students to reach their full potential. Teachers in the district pride themselves on providing a well-rounded education that prepares students for the future. In addition to public schools, Rochester is home to several private schools such as Lourdes, Schaeffer Academy, Resurrection Lutheran School and Rochester Central Lutheran School. These institutions get high ratings from parents due to their small class sizes and the individual attention each student receives. Higher education opportunities are found at Rochester Community and Technical College, which shares a campus with a branch of Winona State University. Since 2007, the University of Minnesota Rochester has utilized a downtown campus devoted to health sciences. Students of all ages have much to gain from an education in Rochester. Moving to a new town is sure to feel overwhelming, and a large part of the challenge is meeting new people. When you live in an apartment, you have the opportunity to strike up a conversation with a total stranger and build a friendship with unbeatable convenience. Check out our blog, “Break the Ice: How to Meet Neighbors in an Apartment” for tips on how to make friends in your building.